You find you are in an accident through no fault of your own. You want to help you find your way through the system to claim for your loss. We know the Injuries Board system well - we wrote the book on it which is simple and easy to follow. As we know how the system works we are busy with claims all the time but never too busy not to take your case. 95% of cases are sent in by expert Solicitors who know the tips and traps when bringing a Claim. So benefit from our experience. Let us lodge your claim, you work on recovering from your injuries and we will look after your claim. Contact us now using the numbers or the e-mail below. Michael Monahan Solicitor can help you with your personal injury claim in the Sligo area and throughout Ireland via our Dublin offices. Our personal injuries solicitors will provide you with a professional service and impartial advice. Michael Monahan solicitors have experience in managing claims for all kinds of accident types, including car /motorcycle crashes, slip and fall and injuries at work. You can claim for any pain and suffering caused by your accident as well as any loss of earnings, medical expenses etc. To arrange a consultation with a personal injury solicitor in Sligo, please call us on 071 912 9070 or contact us online. Get our book on Personal Injuries Board Claims delivered to you. 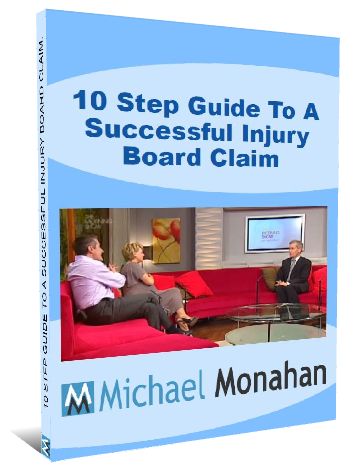 To download the "10 Step Guide To A Successful Injury Board Claim" all you have to do is put your details in the form below and we'll send the guide immediately. Download this guide to your successful personal injuries claim today! Even though you may have a long history with a family doctor. They may not be the best person to assess the type of injury you have received in a road accident or in work. Seek to find a specialist dealing with your particular injury. You now have two years from the date of an accident/incident to lodge a claim with the personal injuries board. Do not make the mistake of leaving things and running out of time. Injuries can plague you for a lifetime, and you are entitled to compensation if they are not your fault. Gather vouchers for all your expenses. The system provides for payment only on receipt of vouchers.These are for loss of earnings or for medical expenses or treatment costs. All can be added into the claim provided you have paperwork to back it up. You must clearly communicate what your injury is and ensure that individuals who are assessing your claim have full knowledge of what you are going through. The system was set up with the intention of being a lawyer free zone. The reality is that 97% of the claims lodged are through solicitors offices. Find a professional solicitor, to give you the best opportunity for compensation. DOWNLOAD OUR GUIDE TO FIND OUT EVERYTHING YOU NEED TO MAKE A SUCCESSFUL PERSONAL INJURIES BOARD CLAIM TODAY!
" In contentious business, a solicitor may not calculate fees or other charges as a percentage or proportion of any award or settlement."